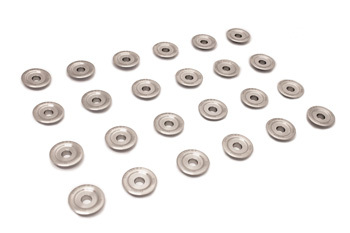 Valve spring retainers can be a weak point on high output, high RPM BMW engines. Excess valvetrain weight can cause valve float and spring fatigue with very aggressive cams at high RPMs. Our VAC Titanium Valve Retainers are manufactured to our specs for the absolute lightest weight possible to help prevent both of these issues. For 6mm S54 valves, inc. 24 pcs. Ti valve retainers are durable for racing and suitable for extreme use applications, however; due to the soft nature of Titanium *they should only be used in conjunction with high performance valve springs and have inspections periodically. If you're looking for a solution for applications that will not be inspected regularly, please inquire on our light-weight Hardened Steel Alloy retainers.